Cookaholics Bulletin Board • View topic - Meatcake! We're going to a Meatloaf party this afternoon. Immediately I thought, "Meatcake!" You should be more than "happy with the outcome"....great idea! You and kathy will be the hit of the party. Kathy, that is genius. I love the carrot and pea details. And thanks for posting the photos (and now you need one for you face book profile). Have fun at the party and that cake WILL be the hit. Yes, we were the winners. It was a party for a returning vet from Iraq that Pete will probably be working for. He's a captain & signed up when he was 16. Very impressive guy. 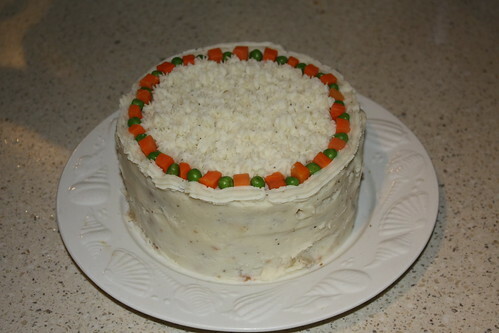 Darcie was the inspiration for the meat cake. I made the meatloaf, but Pete did the decorating. Darcie made one in a heart shape with carrots as a decoration - Pete decided to use peas & carrots. It really was quite beautiful. I guess you all know that the frosting was mashed pots. Wow, I'm dazzled! How clever! Looks fantastic! I like the decorations better than the one I did. Well, Darcie, you gave us the inspiration. Thanks. Wow, nice! 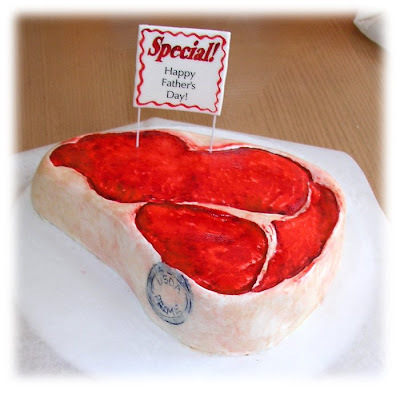 That's the best decorated meatcake I've seen on the web.